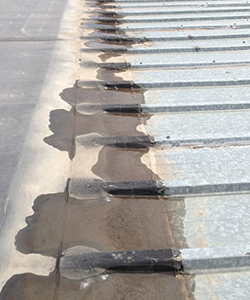 There are countless leaky and rusting commercial roofs out there that need serious attention. Choice Roof Contractors are experts at detecting leaks and other damage to roofs that need immediate repair. We have found Conklin’s roofing systems to be the perfect way to solve virtually any dilemma – big or small. Using Conklin products because of their outstanding track record, many of our Choice Roof Contractors guarantee complete satisfaction with a warranty that covers both labor and materials. Conklin’s lightweight, “green” solutions produce impressive results and are truly cost effective. In addition to saving you considerable expenses disposing of an existing commercial roof, you can count on lower energy costs from better insulation and reflection of the sun’s rays. Fixing any rust and leak damage to your existing roof. 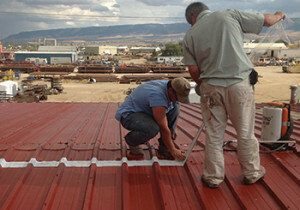 Applying a rust-inhibiting primer if a metal roof is involved. Treating your seams and fasteners where your leaks are most likely to occur. 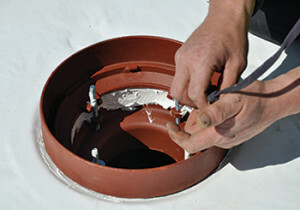 If necessary, sealing your entire roof with a durable, ENERGY STAR-rated seamless coating. Choice Roof Contractor Group’s durable leak prevention systems can provide decades of protection… for peace of mind for both the business owner and our roof contractors. Our commercial roof leak detection services combined with the Conklin roofing restoration system can prevent a simple leak from becoming a huge disaster. Most people are not aware of the damage that can be caused by a small roof leak. As soon as the leak begins, the damage starts. Often the first thing that the water comes into contact with is the buildings insulation, and the insulation absorbs the water like a dried up sponge. This prevents the insulation from doing its job. Heat or cold can quickly pass through the wet insulation. Your energy costs will start to rise, and that is just a drop in the bucket when compared to what happens next. The water will find its way through the insulation. It will then start damaging anything it comes into contact with. Ceiling tiles will start to show stains. The water is quickly absorbed by anything that is made from wood, quickly causing structural damage. Metal materials will start to rust and corrode also causing further structural damage, but things will get worse. Once the water has snaked its way throughout all of these building materials, potentially toxic mold will start to grow behind the walls and in the ceiling. This creates safety concerns for you and your employees, and it also creates added mold inspection and removal costs. Leaky commercial roofs can also attract all sorts of pests that can create even more problems. Termites, cockroaches, ants and rats are all attracted to water damaged buildings. As you can see, roof leaks are very serious, but all of this can be stopped with our leak detection services. Once the leak is found, commercial roof restoration systems can be put into place to prevent the leak from happening again. Our roof contractors stand firmly behind the energy-efficient products they use with up to a 20-year, non-prorated warranty. What are you waiting for? Don’t let a small roof leak turn into a huge problem. Call us today, and we will put a stop to any commercial roof leak!